With so much unused stuff languishing in junkyards and landfills, building a backyard shed doesn't have to cost a pile of money. Instead of heading down to Home Depot to buy new materials, why not do what these folks have done - use recycled materials to get the job done. Turns out any kind of material is fair game. 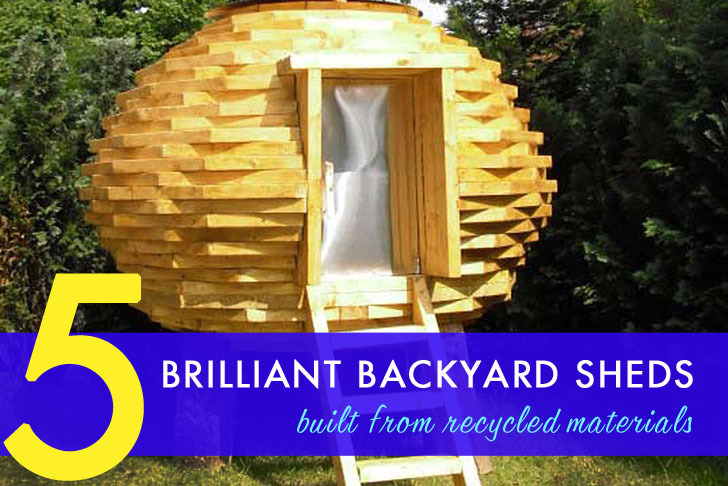 We've rounded up 6 brilliant backyard sheds from around the world that were built with everything from umbrellas, car tires, yogurt containers and even old boat parts, like this one by Alex Holland. Spring is a great time to start a DIY project, so go ahead, don't be shy - flip through our gallery and get inspired! Made from FSC-certified wood and random scraps, Coco Hut is a cozy shelter shaped like a ball. Created by Dutch designer Gert Eussen, it stands on stilts and can be accessed through a tiny wooden ladder, just like a treehouse. Built by securing recycled windshields on a wooden structure, La Serre is a tiny eco-shed that can also be used as a greenhouse. Created by Sebastien Ramirez, a French designer, it was made entirely from free recycled and found materials. 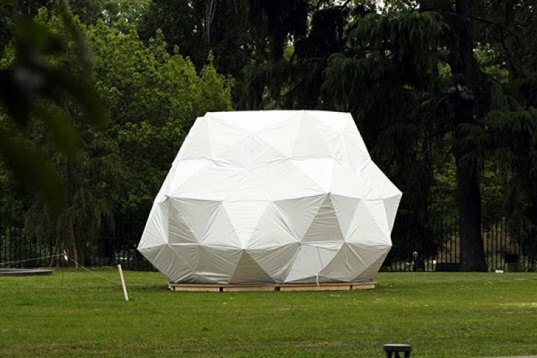 Formed with 15 standard parasols, Casa Umbrella is a pop-up shelter shaped like a globe. Designed by Japanese architect Kengo Kuma, this light, waterproof cocoon can be set up in any location in no time flat. Eco Shed is a green-roofed bike shelter made from an FSC wooden frame and Corten steel, and then covered with recycled yogurt carton plastic. Made by Londoner Marcus Shields, it can store garden tools as well as up to 11 bicycles. Made from reused car tires from a local garaage, along with old windows and scrap wood, Maisongomme is not your average garden shed. Designed and built by Refunc, this fantastic tiny structure is both water- and winter-proof. 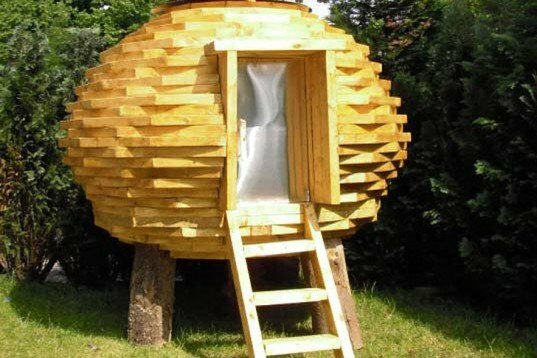 Created by Dutch designer Gert Eussen, this ball-shaped shelter is built from FSC-certified wood and a variety of scrap materials. 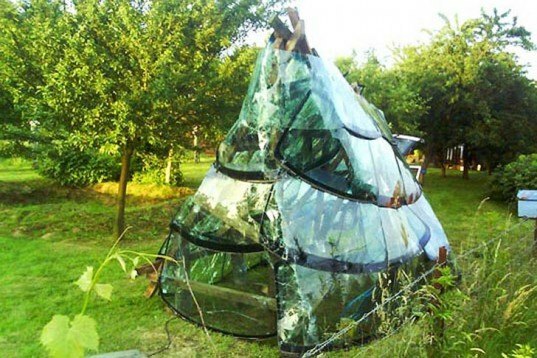 If local trees can't support a treehouse per se, this is the next best thing! Created by French designer Sebastien Ramirez, this fabulous shed was created totally for free: he collected all the parts he needed from scrapyards and such, and was able to build this structure without any need for a budget. Japanese architect Kengo Kuma created this waterproof cocoon from 15 umbrellas. It's not just a great storage space; it can also be used as a pop-up, weatherproof shelter, as it can be assembled both quickly and easily. 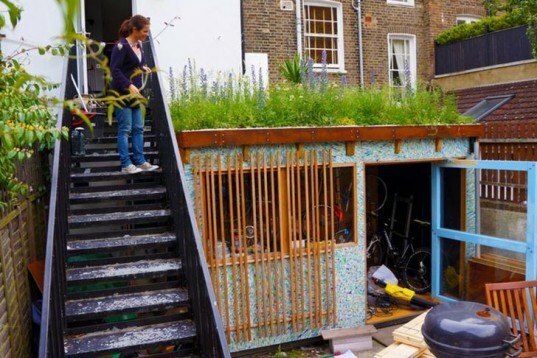 Marcus Shields's shed can store up to 11 bikes (as well as a plethora of garden tools), and was created with wood scraps and plastic made from recycled yogurt containers. 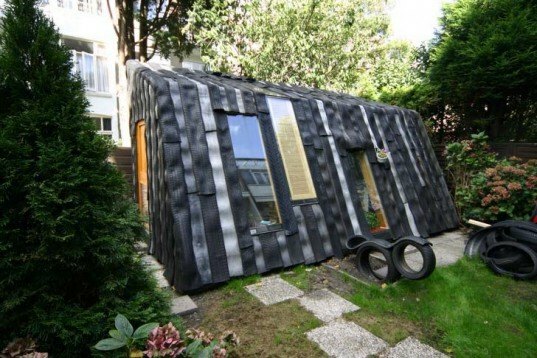 Maisongomme by Refunc is not your average garden shed, unless your neighbors are also building theirs from old tires and upcyled window frames.